I have heard several different perspectives on one of the sessions at the World Congress of Jewish Studies. It was a session devoted to new directions in the study of the Babylonian Talmud. The speakers were Robert Brody, Leib Moscovitz, Richard Kalmin and Chaim Milikowsky reading a speech for Yaakov Elman, who was unable to attend. Professor Brody apparently presented, highly condensed (but including a joke), the basis for his belief in the "Stam kadum". I don't know the details, but I can explain the essentials. The "Stam" is the extensive anonymous portion of the Talmud, what is left when you remove all the attributed quotes from Tannaim and Amoraim. On the whole, it can be described as the cement that holds together the bricks, the "meimrot" or sayings of named figures. But very often, an entire discussion will develop without any names coming up. In many instances, these discussions introduce concepts that were not explicit in any of the meimrot. 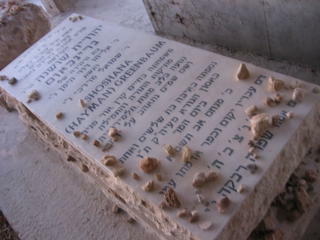 Many critical Talmudists, and foremost among them is Prof. David Halivni, have developed the approach that all of these discussions are antecedent to the named Amoraim, and that the concepts and ideas developed in the Stam are not necessarily implied in the meimrot, or even compatible with them. This approach, which in some ways has been developed further by Prof. Shamma Friedman, has spawned innumerable studies and even a website. Now, this approach is dynamic and evolving, and the nuances depend on the practitioner. Apparently, Halivni has become more and more sweeping in his view of the Stam as being late, later than all the Amoraim and perhaps to be identified with the mysterious Savoraim. But maybe earlier than them. In any case, always later than the Amoraim mentioned in the sugya. Brody, generally, dislikes generalisations. And the point of his speech at the Congress was to demonstrate that, in some instances, concepts explicit in the Stam are, in fact, implicit in statements by Amoraim. Therefore, it is probable that the discussion of the Stam existed, in some form, during the lifetimes of the Amoraim. And, therefore, not all Stam is late. Hence "Stam Kadum", ancient Stam. Leib Moscovitz gave a much less ambitious speech. He grappled with the methodological challenge of determining whether a given meimra is authentically Amoraic. Sometimes there seem to be meimrot that are entirely artificial. At other times, a meimra would seem to contain foreign elements that were added on at a later stage. He presented several different tools for answering this question - tools which he has used himself, many of which are presented by Shamma Friedman in his studies - and the shortcomings inherent in each one. His conclusion was that there is no "magic bullet", and at the end of the day, a scholar must revert to his own intuition. I have not heard enough about the speeches by Kalmin and Elman to present them here. Apparently, there was a feeling that it would have been appropriate to allow Friedman and Halivni, both of whom were present at the session, an opportunity to respond to their critics. But there was not enough time, and such an opportunity had not been anticipated. From what I have heard, this session, though not officially devoted to any specific approach in scholarship, was a testimony, even if a partially critical one, to the extent to which Halivni and Friedman have left their mark on Talmudic studies. And it is a cause for happiness that they are both still with us, continuing to contribute and to think. At the JNUL yesterday, I saw a bunch of new publications. It will take a while to get through appraising them all. But just some quick notes. Elizabeth Hollender published her massive index of piyut-commentaries, titled Clavis Commentarium. Eva Haverkamp published a new edition of the Hebrew Crusade chronicles. Moshe Samet's essays have been collected and published as "Hadash Asur min ha-Torah". The speeches from the evening in memory of Israel Ta-Shma have been published. A new volume of Tarbiz is out, with an article by Adiel Kadari on the "heavenly academy" in later midrashim, among others. Update: Rami Reiner's short article in the Ta-Shma memorial booklet raises the fascinating possibility that Rabbeinu Tam was a member of the French royal court. He pulls a few sources together to make this more likely, but his focus is on an unpublished responsum Rabbeinu Tam sent to Henry, Duke of Champagne. I found myself at the Shalom Hartman Institute today, and bought Yoni Garb's new book. The title is "The Chosen will become Herds": Studies in Twentieth Century Kabbalah. The focus seems to be on Rav A.I. 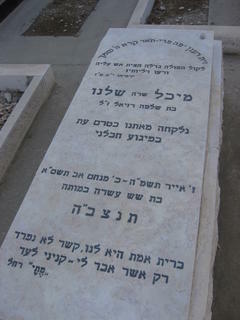 Kook, Rav Yehuda Ashlag and their respective students and followers. Aharon Mundschein, Did Abraham ibn Ezra know the Biblical commentary of R. Joseph Kara? Ophir's article is an outgrowth of his work on the critical Ashkenazic siddur, under Yona Fraenkel. I hope we see the finished product soon. Ginze Qedem, a new journal with an old name published by the Friedberg Genizah Project, is also available. I forgot to post this on time. A photo of the gravestone of Dina Carter, who worked in the Manuscripts and Archives department at the National Library. She was murdered in the bombing on Mt. Scopus three years ago. 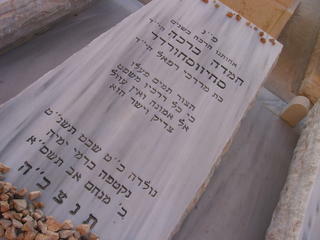 The Hebrew date of her death was three days ago, the 22nd of Av. A sculpture she made, a fascinating exploration of the relationship between readers and books, is on display in the lobby of the library. I was unable to attend the Fourteenth World Congress of Jewish Studies this summer in Jerusalem. But I have been attempting to glean as much information as I can, from friends who did attend and some who spoke there. Hopefully, I will be able to present some of that information here. Last night I heard a little about the session devoted to Mif'al ha-Mishna. The Mifal aims to produce a catalogue listing all the textual witnesses - complete and fragmentary - to Rabbinic literature - Mishna, Tosefta, Bavli, Yerushalmi, Alfasi and probably some others. 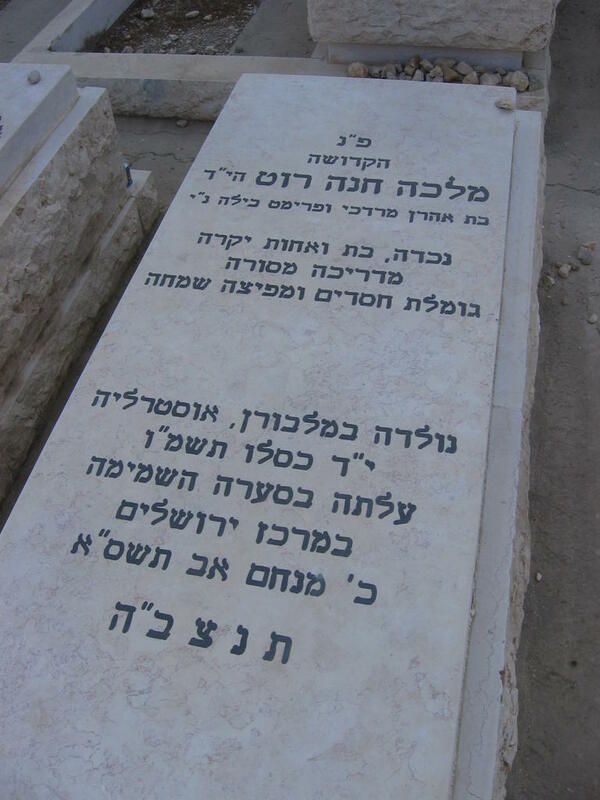 To date, the only section to be published was Otzar Kitve Yad shel Midreshe ha-Halacha by Menahem Kahana. I was aware of the frenetic activity at the Mifal leading up to this session of the Congress. But apparently the announcement there was that the catalogue will be published in a year. At some later stage, the fragments themselves will be made available online. This is momentous news, and when it is actually carried out, will make the textual study of Rabbinic literature much easier. But, as David Rosenthal teased Jacob Sussman during the session, the catalogue has been in the offing for nearly 30 years. Rosenthal claims that he himself gave the Israel Academy of Sciences his critical edition of Mishna Neziqin a full seven years ago, and it is entirely their fault it has yet to be published. Another of the speeches delivered during that session was by Dr Ezra Chwat and was devoted to Geniza fragments of Alfasi. Study of the fragments has given Ezra a clearer picture of the extent to which the Rif was studied throughout the Mediterranean. Comparisons to Islamic modes of learning and textual transmission allow him to make interesting suggestions. For instance, the part the book played in the transition from oral learning of the Talmud to a written culture. Ezra has pieced together 52 copies of the Rif from the Geniza with titles (altogether he has found 776 discrete copies of the work). 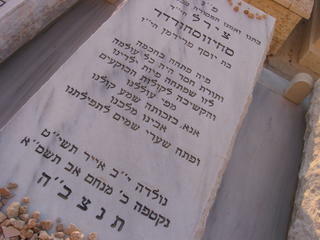 Only nine of them carry the name "Hilchot Harif", or anything similar. The rest carry only the name of the tractate. Chwat suggests this reflects the feeling, on the part of the copyists and the consumers, that the contents was simply Talmud. The written Talmud, as opposed to the longer, more discursive Talmud that was learnt orally in the yeshivot. A shorter Talmud, that released the public from an information glut and allowed laymen to access their religious tradition. 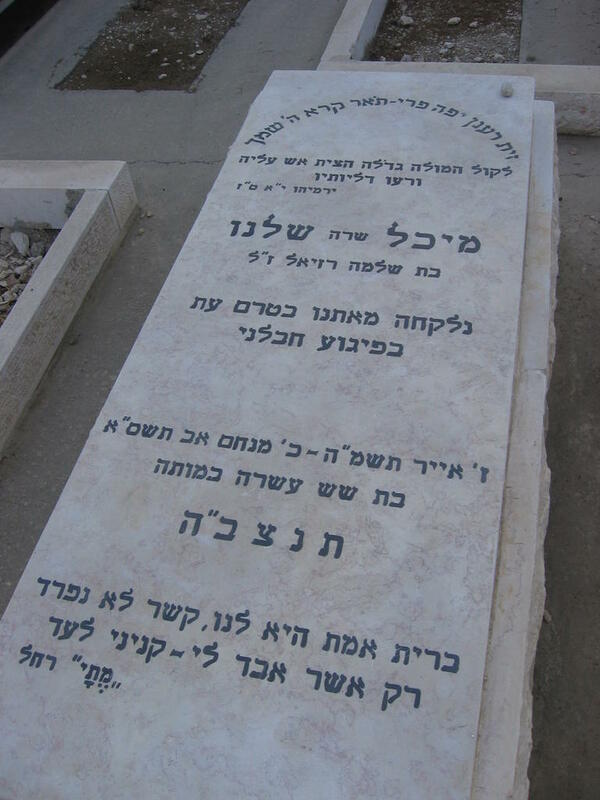 The project has unearthed copies of Rif written by famous scribes, such as Halfon ben Menashe, who flourished in Fustat in 1100-1138, and Yefet ben Shlomo, whose copy of Mishne Torah received the approbation of Maimonides himself. Please feel free to send me descriptions, summaries and notes from the Congress. All from the same family. The parents and three of their children. Today was the fourth anniversary of the bombing in the Sbarro pizza store in Jerusalem. I visited the graves of some of the victims. 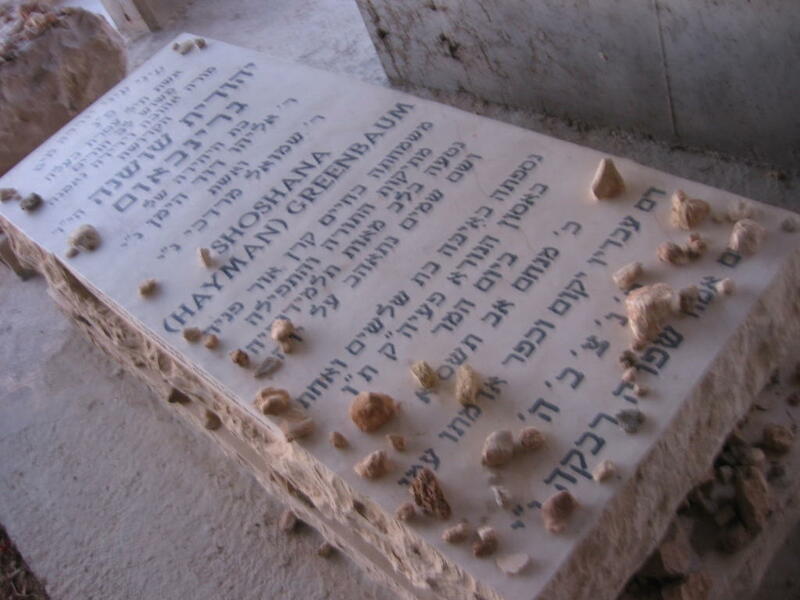 Shoshana Hayman Greenbaum was an only daughter, a young wife and an expecting mother. And a teacher, and a wonderful person and a tourist visiting from the United States. Malki Roth. Born in Melbourne, Australia. She was almost 16 when she died. Beside her lies her friend Michal Raziel, who was 16 years old. Her father died when she was a young girl, and she was the youngest of her sisters, the only unmarried child at home. Her gravestone carries a line from the poet Rachel. "All that is really mine, is that which I have lost." I'm back in Israel. I apologize for the inactivity of the past couple of weeks, the result of various pressures and technical problems. Hopefully, the next few days will make up for that. There is, today, a large body of popular fiction that tries to inject the excitement of the thriller into academic bibliography. I think it really began with Umberto Eco's brilliant novel, Foucault's Pendulum. (By the way, I saw a Foucault's Pendulum this week!) But it only really took off in the wake of the Da Vinci Code. I think that by now it is possible to draw some conclusions about this genre. I want to comment on one, as a warning to others. My impression is that many of these books (or movies) stem from a desire on the part of the author, and perhaps the audience, to connect their learning and interest in the academic endeavour with things that are "really exciting". And here lies the crux of the problem. What practical relevance can philological arcana ever have? Or, to put it differently, how can anyone get fabulously rich by being a scholar? There are some easy solutions. One is the supernatural - knowledge matters because really, things are not as they seem. In Eco's book, he plays with this solution, flirts with it, but never lets it take over. Sometimes, even full-blown occultism can be weaved in with elegance. In less skilled hands, the supernatural solution is silly and off-putting. The second is even less imaginative. It's all about money. What kind of money can book knowledge bring? Hidden treasure, of course. Duh. Though this tack also can be followed with elegance. The third approach is most interesting, and it is really what Foucault's Pendulum is all about. The power that knowledge, or the belief that there is hidden knowledge out there, has over real lives. The Da Vinci Code attempted this, and certainly hit a nerve. But the story wasn't compelling enough, the mystery wasn't convincing enough. But some of the books I have read recently fumble this one as well. Lev Grossman's Codex, for instance, runs into the ground with a contrived, boring family scandal. A few weeks ago I read Leslie Silbert's Elizabethan novel, the Intelligencer. Even after finishing the book, and puzzling over it for several days, I couldn't work out the criminal motivation driving the story. I think he wants the jade dragon. I don't know why. I don't really care. I enjoyed reading most of these books (though by no means all of them). I like reading about books. And, as I tried to suggest here, I think there is great potential in exploring the ways in which investigation of the past can influence the present. But it demands a little more imagination. Ha'aretz carried an interesting description of Avraham Elqayam's speech at the World Congress of Jewish Studies. His main point, which he brought home in an immediate fashion, was that academic study of a field such as mysticism must have an experiential, personal aspect to it. If you study meditation for a living, you must practice meditation. I have noticed certain teachers of mine who, in a less demonstrative way, have reached the same conclusion. Someone who has studied rabbinic mnemonic systems and seems to have used them himself to memorize the Mishna. Someone else who, in studying rabbinic literature, has taken upon himself customs and practices he found compelling. Following Rabbenu Tam's opinion in calculating the end of Shabbat, for instance. I believe in this strongly. Not, of course, as a requirement. Obviously, not every scholar must take upon himself the lifestyle he is studying. But for me, there is a strong connection between the material I study and the life I want to lead. 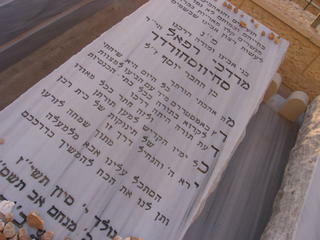 I don't really know what to say about the murders in Shefar'am, but I think I should say something. This week's parsha, Mas'ei, makes it very clear that the spilling of innocent blood is a sure way of defiling the land of Israel. That defilement is not caused solely by the murderer, but by the society which allows his act to go unremarked. It is too long that idle comments about the worthlessness of non-Jewish lives have gone unchallenged. That religious Zionist teenagers can flirt with xenophobia and feel it makes them more sincere Jews. That, whenever a violent act is perpetrated against Arabs (or Armenians or whoever else these fellow-religionists of mine can get their hands on), the religious establishment dismisses them as weeds. Unfortunately, I know what will happen. I watched it transpire twice before - after the massacre in Hebron and after Rabin's asassination. The left-wing will lash out against all vestiges of religion, and make sure that the lines are clearly drawn. Sane voices within Orthodoxy will be drowned out by the attacks from the left, and the defensive apologetics on the right. So I will try to make my point, on my own turf. It is absolutely true that the vast majority of right-wing, religious Israeli Jews are not violent. The same goes for the vast majority of those people who live in the West Bank and Gaza. But that majority has been too forgiving of violence. It has encouraged it with idle, after-davening conversations about how best to deal with the Arabs. It has sowed the seeds by sending their children to learn in schools staffed by teachers heavy on ideology and light on secular education. It has stifled other voices by pillorying would-be leaders like Rav Amital and Rav Yoel bin Nun, marginalizing them so that their message is only heard by the converted who no longer care that they are not considered authentically religious by much of Israeli Orthodoxy. There, I've said my piece. I have no expectation that it will make any difference, that anything I say will reduce the chances of another Jewish kid taking up arms to kill people for no reason. But I tried. By the way, I notice that the family doesn't understand why the army did not confiscate the murderer's gun long ago. This is not the first time such a thing has happened. I remember a fellow from my high school, who already then was imbalanced. The IDF decided to draft him, and to provide him with a machine gun. With which he then travelled down to Hebron and tried to shoot up the marketplace (failing to hurt anyone). I also remember someone who served with me in the army. He was a very nice guy, whom I remember fondly. He was very into religion. Of all kinds. I once talked to him about the Hekhalot literature, so he provided me with an illustration, from a Hare Krishna book. I told him about Shabtai Zevi, and he said it reminded him of Jesus. Who, by the way, spoke to him on occasion. I liked him. But a lot of the brutes in our unit delighted in tormenting him. Once, on an educational trip to Sde Boker, he disappeared. They searched for him all night. In the morning he turned up. He had spent the night in a cave in the desert, but came back because he had no water. They sent him home for a day. Then he returned to base. I watched him walk past - with his gun. That's funny, I thought. Surely they realize he is a little unbalanced. Wouldn't it be a good idea to take his gun away for a bit? Five minutes later, a shot ran out in the base. No, he hadn't killed himself. He had made sure to just knick his finger. But finally he got what he wanted, a way out of the unit. Clearly, the Israeli army is not paying enough attention to the people it is giving its guns to. I finally got to the Talmud exhibit at the YU Museum. There were some really nice things there - a Bomberg Talmud on vellum, and another on blue paper. The Sabbionetta printing of Kiddushin, which arrays the Tosafot Rid and Ritba on the page. One of the most impressive aspects of the exhibit is the provenance of the books on display. Many are from JTS, but many others are from private collections. Those are the books the public doesn't normally have access to, and this exhibit shows what a range of treasures are held by private collectors. The first manuscript on display as you walk in is a Geniza fragment of Bavli Baba Kamma. It is a good example of how the Geniza brings the Jewish world together. The text is written in an Oriental (i.e. Middle Eastern) hand. It contains interlinear corrections in a Sefardic script. And glosses in Ashkenazic letters. The curators did not pay much attention to marginal comments in the printed books on display, which is a shame. There is an ed. princ. 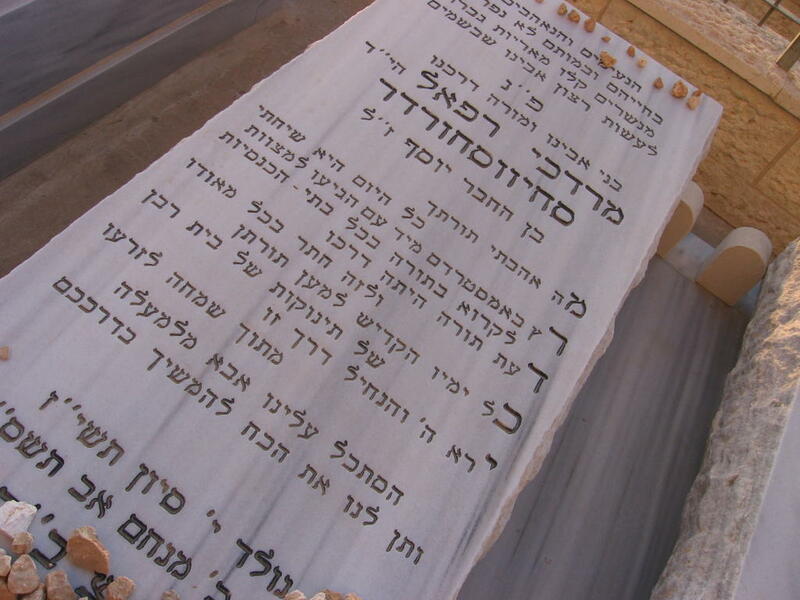 of the Talmud Yerushalmi with personal milestones in the life of its owner, Yedidya Benveniste. A Wilhemsdorf 1716 printing of Megillah that belonged to someone named Eizik Berlin in 1853. There were some silly mistakes in the captions. The Wien 1865 Talmud contains textual variants, titled Or Haganuz, from a manuscript in Vienna. But that manuscript, and those variants, are of the Tosefta, not the Bavli. And a large volume printed by Isaac Prostitz in Cracow 1597 is not Bavli either, but rather Alfasi. The explanation of the difference in editorial technique between the Bavli and Yerushalmi (persecution prevented the Yerushalmi from being completed) was presented, I think, too confidently. An odd choice was one of the websites featured in the contemporary section. Come-and-hear, which besides hosting a transcription (legal?) of the Soncino translation of the Talmud, also provides the full text of a book by a woman named Dilling, who exposes Talmudic Judaism as a Marxist conspiracy of the Anti-Christ. Some other notables pieces were a small volume of Baba Kamma copied by Anshel Moses Rothschild and passed down through his family (today it belongs to YIVO). A gemara printed in Shanghai in 1942, inscribed with the name Moshe Meir Mandelbaum, who was, as he says there, "currently in Shanghai". The video footage of people learning Talmud the world over was cute. Recognized a few people I know. The special part there was a couple of minutes filmed in Ponevizh before WWII. It shows a teacher (sorry, no idea who it is), looking very animated and happy, learning with his students crowded around. All of whom were well-shaven, with ties and fedoras. But must we really accept that the Schottenstein translation of the Talmud is the pinnacle of this tradition? Israeli MK Naomi Blumenthal has raised the idea of establishing a breast-milk bank in Israel. It is a nice idea. But it might be worthwhile giving some thought to problems that may arise. For instance, according to Islamic law, breast milk creates the same kind of bonds as does blood. Thus, a baby boy and girl - not related in any way - who were breast-fed by the same woman, would be forbidden to marry each other. Therefore, great care is taken in keeping track of which child suckled from which woman. Keeping records like that for a milk bank would fairly difficult. And since Israeli hospitals care for one or two (maybe more?) Muslim newborns, perhaps this is worth devoting a couple of minutes thought to. This, by the way, I learn from an article on breastfeeding and Islam by Prof. Avner Giladi. Speaking of Islam, I read an article in the new volume of Speculum. It was written by a doctoral student in Melbourne named Marco Zuccato, and deals with the astronomical writings of Gerbert of Aurillac. Not something I know anything about. But his main point is fascinating. 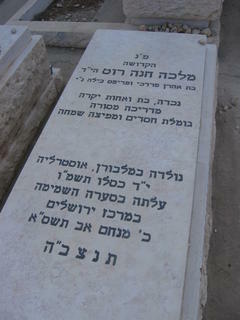 Gerbert is described as using a technique described at length by Dunash ben Tamim, a Jewish scholar from Kairuan. Gerbert studied for a while in Catalonia. A few years earlier, Hisdai ibn Shaprut, right hand man to the caliph of Andalus, had visited there on diplomatic missions. Since it is well known that, besides being a diplomat and corresponding with the Khazars, Hisdai was also a patron of the arts and sciences, Zuccato suggests that it was Hisdai who introduced these scientific innovations into Christian Catalonia. This theory helps explain the transition of scientific knowledge from Islam to Christianity at a time when there was little or no intellectual contact between the religions. 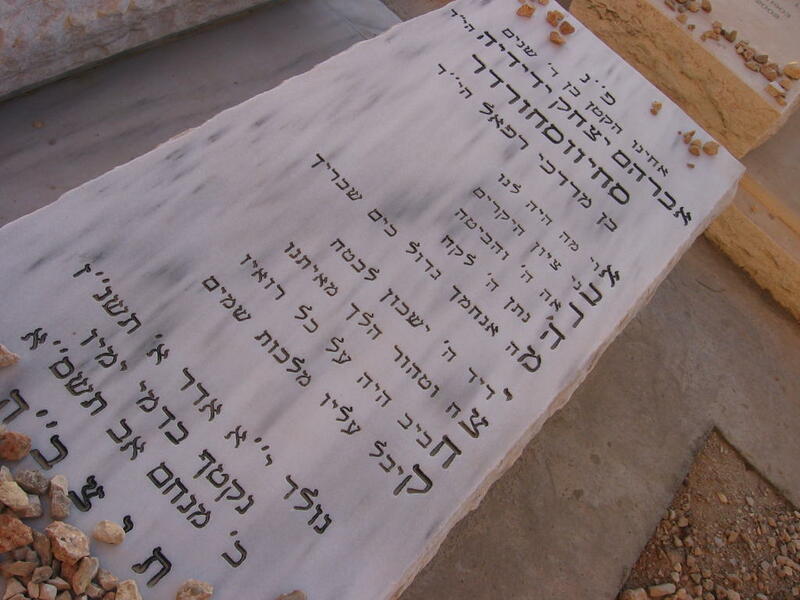 Today, 25th of Tammuz, is the fifth anniversary of the death of my friend Natan Axelrod. Please read about him. Natan was born in St. Petersburg (then Leningrad) in 1976. In the mid-Eighties his parents applied for the right to emigrate to Israel, and were turned into Refusniks. After several difficult years, they moved to Israel, settling in the northern suburbs of Jerusalem. There they became religiously observant, and Natan was circumcised at age 10. He moved to a religious high school, where we became friends. After school he continued on to Hesder, learning first at Yeshivat ha-Kotel and then at Har Etzion. He served in the IDF in the Artillery Corps. 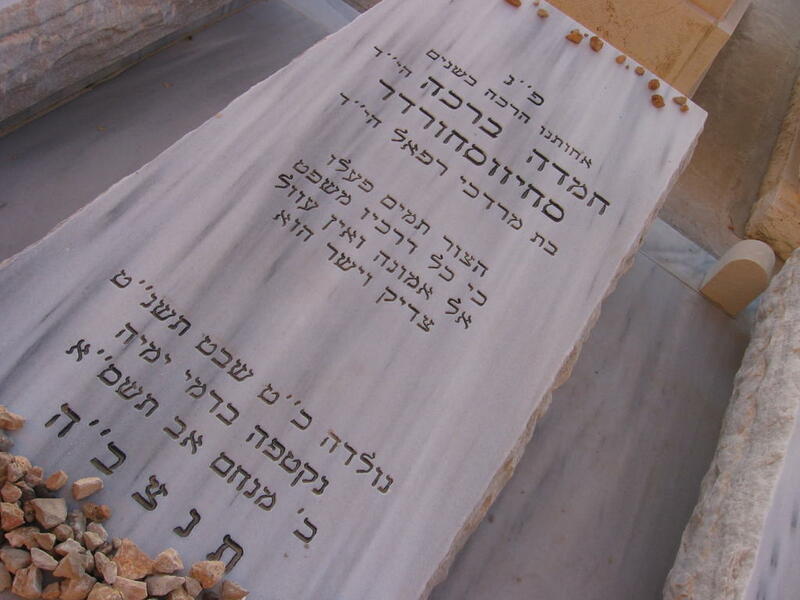 On a tiyul with his friends from Gush, near Ein Gedi - under extreme heat conditions - Natan collapsed and died. Natan was a frighteningly sincere person. He had very high standards of ethical conduct, which he demanded from himself, from his friends and from his teachers. He never looked cool, always spoke with a funny accent and an odd way of expressing himself, but that never stopped him. True to the Russian mold, he excelled at mathematics and sciences. In yeshiva, he applied his methodical mind to Gemara, but more so, to Hassidut and the study of prayer. This was a direction he would undoubtedly have developed further, if he had been given more time. One story about Natan exemplifies, to my mind, his approach to life. He expended great effort and ingenuity in compiling a list of the birthdays of all his acquaintances. Not just his friends - even people who could barely stand him. And he would make sure to send every person a birthday letter. He would also be sure never to call anyone by a nickname. Not even the kind of back-slapping, boys-club last names that we all used. He would call a person by his given name, regardless of the consequences. Sadly, many of his classmates did not treat him with the same respect. Natan's parents, and his younger siblings - Shlomo and Rachel - have made valiant efforts to continue their life in Israel. It was never easy, and Natan's death was a crushing blow. 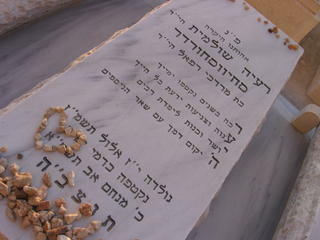 I hope that Natan's memory remains alive for them and for others, and that they find many sources of happiness in life.